Bruce Strong - Insurance Recovery Attorney | Anderson Kill P.C. Bruce has successfully represented clients in a host of complex legal matters, including multi-district class action litigation and multi-million dollar property and liability insurance disputes in both state and federal courts up to the highest levels, and in arbitration. Prior to joining the firm, Bruce was an Attorney Advisor appointed through the U.S. Attorney General's Honors Program. He worked in the Drug Enforcement Administration where he drafted orders and decisions in connection with DEA administrative hearings. In addition, he was a Law Clerk at the U.S. Environmental Protection Agency, Air Civil Enforcement Division where he drafted notices of violation and consent decrees at various stages of litigation. 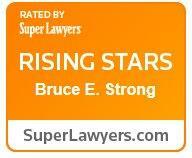 Since 2017, Bruce has been recognized by Super Lawyers as a New York Metro Rising Star for Insurance Coverage.